When I began running races in 2013, I occasionally saw runners wearing shirts reading "rrt", and eventually learned that rrt stood for "runningnerds racing team". At some point, I must have given my e-mail address or Facebook contact to runningnerds, and early in 2015 I received an invitation to join up. How did I meet the criteria to join the runningnerds racing team, you might ask? I do run, albeit in the middle of the pack. But there is no doubt that I am a nerd. On account of my nerdiness, I'm sure that they are very happy to have me. 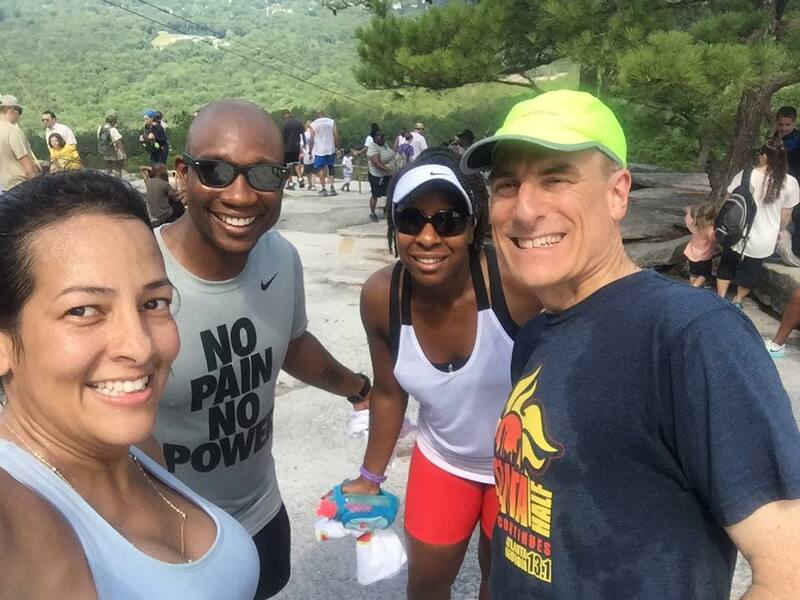 In fact this group is one of the coolest, most fun running groups in Atlanta: without me on board, they would hardly be runningnerds! All kidding aside, runningnerds is really a great group of people, very inclusive and with fun events and group runs throughout the year. Temilola Sobomehin, a k a "Tes Sobo", founded runningnerdnation.com just a few years ago. 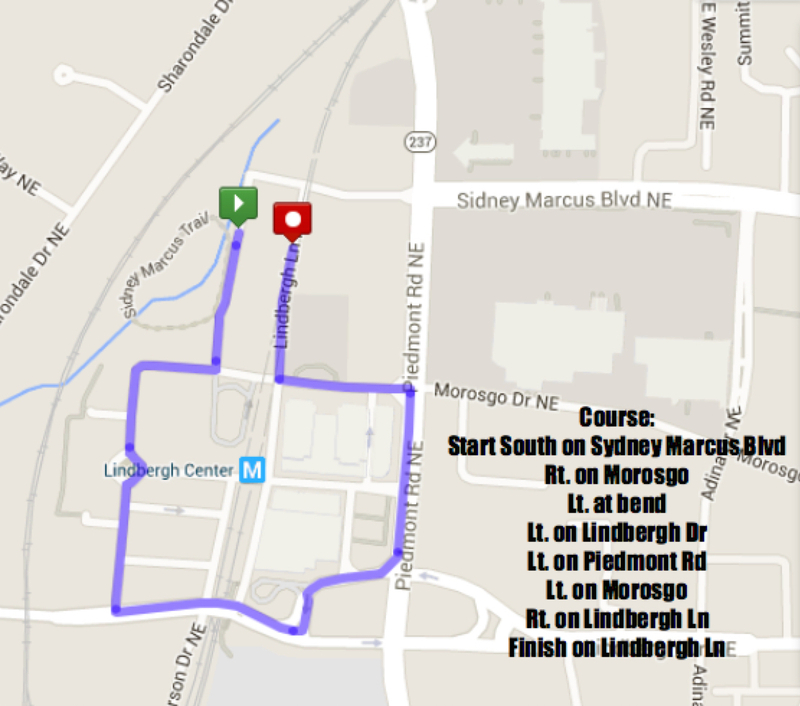 I encourage you to click on one of the runningnerds links [here!] and join the team - it will be well worth it! I've enjoyed several free group runs, the late winter annual party at TopGolf (also free), the summer solstice run at Stone Mountain (free), and meeting fellow runningnerds at many races in metro Atlanta (you guessed it, free!) 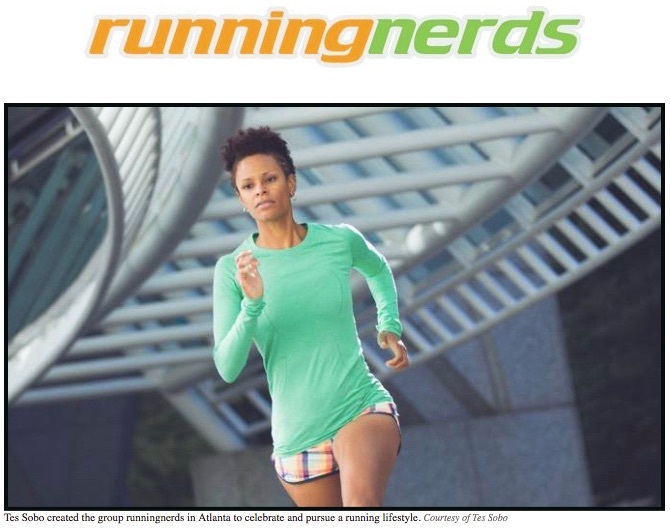 In addition to involving runningnerds in training for and volunteering at many of the established races in metro Atlanta, Tes has also started several regular race series, including the 1 Mile Race Series, in its second year. I haven't managed to run any of these races before today, often because they have been on the same day or the day before a big race for me. In one case the race day conflicted with a work commitment. But today's race was the day after the Decatur-DeKalb 4 miler. I'm now more confident in running back-to-back races as long as neither race is a particularly long distance. One of my buddies in the Tucker Running Club, Brian Minor, told me that he wanted to run a 1-mile race after he heard about my participation in the Morningside Mile. We agreed to try today's mile, running with Brian's girlfriend Beverly Ford, at the Lindbergh MARTA station. The Lindbergh MARTA station is one of the larger transportation hubs for the city of Atlanta. A residential community has developed around the station, across Piedmont Road from a redeveloped shopping center. Even early on Sunday morning, the area was relatively busy, not only with MARTA buses and vans, but also with taxis and a few private vehicles. During our warmup run about 30 minutes before the 8:30 am race start, we had to be careful of automobile traffic in the area. However, the cones were laid out as we were running, the police were arriving at key intersections, and streets were beginning to close down, so it was apparent that our route would be well-protected. Having warmed up with a couple of easy miles, Brian, Beverly, and I gathered at the starting line. There were several dozen of us at the start (actually 72 finishers when I looked at the official results). I didn't remember to sync my Garmin until a couple of minutes before the start, and it wasn't ready when the siren sounded to begin the race at 8:30 sharp. We took off with the siren, running through a parking garage for the first part of the race. I had started off to one side of the pack so was able to advance without much difficulty past slower runners to reach a steady, comfortable, yet relatively quick pace. Before we emerged from the garage, Brian sprinted past me on my left, then he settled in at a similar pace ahead of me. Emerging from the garage, I noticed that my watch had synced and so I started the time, mostly to get data on my heart rate monitor. After the first third of a mile, we were fairly well spread out, and Brian was about 50 - 75 feet ahead of me, with two other runners between us. I didn't have a good sense of my pace, as the Garmin wasn't registering properly due to the tall buildings in the area but felt comfortable enough to maintain the pace for a mile. At the south end of the route, we headed slightly uphill, but the change in elevation was moderate and only for a short distance, and it hardly slowed me down. Before long, we had turned onto Piedmont Avenue heading north for the finish line. Unfortunately my heart rate monitor sounded at this point, but knowing that I didn't have much further to go, I could safely ignore the warning. I passed the two runners between Brian and me - actually I think that they slowed down - but I wasn't able to close the distance on Brian. Afterwards he told me that he was trying to close on Tes Sobo, but he was similarly unsuccessful in catching up to her! 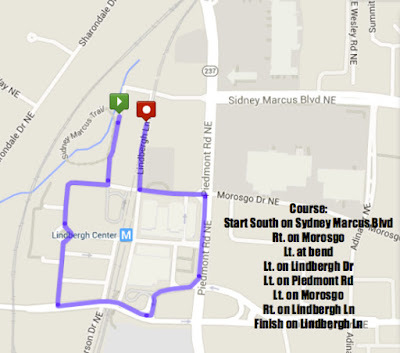 We turned onto Morosgo Drive and then very quickly onto Lindbergh Lane for the straightaway to the finish. I ran past a long line of MARTA vans in the opposite lane of traffic, hoping that no one would open a door as I dashed by. Then the finish line came into view! I had not managed to close the distance on Brian, but had maintained a strong pace, and didn't sense anyone close behind me. The clock read 6:47 as I crossed the finish line! The video begins with three runners in close succession (the third is Temilola Sobomehin finishing at 6:57), followed by Brian Minor at 7:01, and then yours truly at 7:07! Thanks to Bonnie for the video. She slowed down the last part of the video capturing Brian's and my finishes. Whew, that was fun but the fun was over much too quickly! Comparing with other runners who had accurately tracked their times, I learned that the clock had probably started about 20 seconds after we had started, so it seemed unlikely that I had broken my personal record for the mile. But I was certainly happy with the sense that I had run consistently from start to finish. I didn't have any more acceleration to give at the end but I didn't konk out either. As this was a fairly small race, I hoped that I might win an age group award, and was not disappointed! The top person in my age group won an overall masters award, so I was announced as first place in the male 50 - 54 group, with an official time of 7:07, not bad on a relatively warm summer morning! Brian also won his age group (male 40 - 44) at 7:01. Beverly set a personal record at 8:28, although her age group was the largest one represented in today's race, and one of the few age groups where some of the participants didn't win or place. Although it was a small event, I think (and I hope) that Tes has big plans for these races, as this event was a lot of fun and well-organized. I hope that the runningnerds community will continue to grow in the next few years. 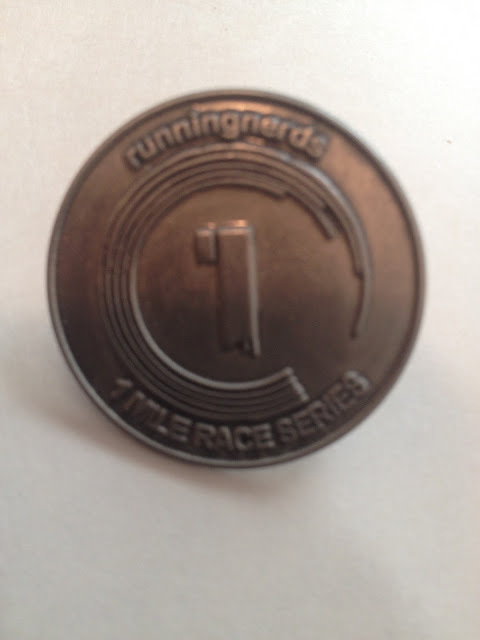 My reward, a pin commemorating the 1 mile race series! Our morning of exercise wasn't done: we then drove to Stone Mountain and climbed to the top, to earn our lunch at the Commons restaurant at the Stone Mountain golf club. Roxana Allen from Tucker Running Club was heading up as we were going back down. Don't forget, you too can become a runningnerd ! Excellent! Congrats on the award!